Visitors are welcome to attend our field days and remember that you are never too old or too young to become a beekeeper! 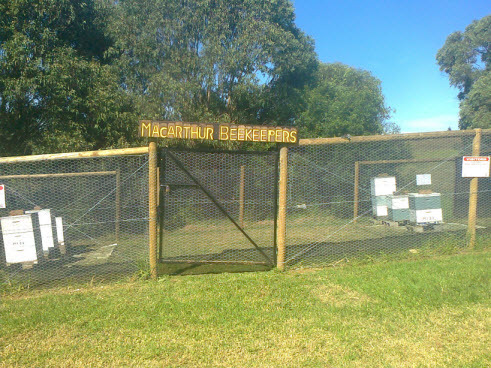 The Macarthur Beekeepers Association Inc. has been serving our district, looking after bees, hives and swarms in spring and summer for many years. Our members are very hands on and always ready with help and advice. Our club is represented at over twelve shows per year, this includes the Camden and Campbelltown shows, we also attend community sites, school fetes and just about anywhere people gather to sell produce and have fun. Our travelling circus is a purpose-built tralier; we give video demonstrations of various beekeeping activities. It also provides transport for all the equipment we carry around at show time. We have exhibits of bees in hives and we also give demonstrations to the general public, we try to generate and interest in bees and in many cases we recruit new members this way. Hopefully this website will help to broaden our membership and more people will learn to enjoy bees and natural honey like we do. The Macarthur Branch meets at the Macarthur Centre for Sustainable Living located at Lot 1 Mt Annan Dr, Mt Annan on the the third Wednesday of each month at 7:30 pm. Why not call past and find out more about beekeeping? Reminder that The Annual General Meeting of the Macarthur Beekeepers Association Incorporated will be held at: Macarthur Centre for Sustainable Living 1 Mount Annan Drive, Mount Annan On Wednesday 21st March 2018 at 7:30pm. What a dry month it has been. That means that you need to make sure that your bees have access to water. Many of us never see the bees drinking but they do. If their usual water has dried up, the water you provide will be used even if you don’t see them use it. It has been a strange month weather wise. Cold, windy and warm and just as you think that it could be a good time to open the hives, the wind comes up. What to do? By now your spring check should have been made. Don't forget to record all the information you collect as this is a legal requirement. Another month has passed and I have noticed many eucalypts in flower. This is a positive sign that winter is coming to an end. Now is the time to make sure that all your frames and boxes are ready for the spring. Often when the bees start collecting they go hell for leather and we beekeepers are left trying to keep up. A honeybee can carry up to 30 percent of its body weight in pollen because of the strategic spacing of its nearly three million hairs. The gap between each eye hair is approximately the same size as a grain of dandelion pollen, which is typically collected by bees. This keeps the pollen suspended above the eye and allows the forelegs to comb through and collect the particles. The legs are much hairier and the hair is very densely packed -- five times denser than the hair on the eyes. With the weather getting cooler it is now a good time to clean up equipment and around the hives. Speaking from experience, it is much easier to fit wax to clean frames than have to clean the frames first, especially when you are in a hurry to do your hives, finding them full and then needing to put in more foundation! Not all salvias (also called sage) flower year round, but this purple one does (see full newsletter). It provides bees with high nectar and low pollen. You can grow several salvias into a six foot hedge or keep trimmed to two feet. Plant your pruning as it grows easily from cuttings. In fact, if you plant a hectare of salvia you would yield 200 -400kg of honey! As we are heading towards winter there is nothing more important than checking on food supply for your bees. Do they have enough honey stores for another dreadful episode of wet and miserable weather as we experienced over the last couple of weeks? Please be advised that the Apiary field day for Saturday 1st of April, 2017 has been cancelled. However, you can still have a great time at the Camden Show held on Friday 31st March and Saturday 1st April, 2017.